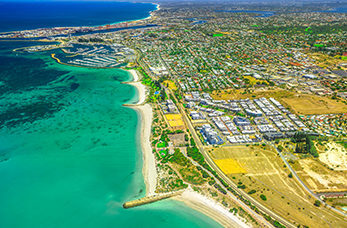 Fremantle is a port city located close to the Western Australian capital city of Perth. 'Freo' is home to an impressive collection of Victorian and early Edwardian buildings which are unique in Australia's cities today. There's an 'arty' feel and a lot to enjoy here such as fantastic museums, galleries, and live music venues. Fremantle Prison was built in 1850 as a convict barrack and remained in continual use until 1991. More than 350,000 prisoners were incarcerated here from 1855 until its closure. Today it remains a world heritage listed building and featured tours that run throughout the day which explore the history of the prison. The Western Australian Museum is located in an atmospheric 19th century harbour building, the galleries are home to the finest display of maritime archaeology in the southern hemisphere including the original wreck from 1629, the Batavia. The Round House is the oldest public building in Western Australia, built initially as a prison in the 1830's, the Round House today is a small museum that focuses on the convict lifestyle of the 1800's. Rottnest Island is situated off the coast of Fremantle, this stunning island has more than 63 beaches and bays with abundant flora and wildlife making it an ideal holiday experience for all the family.